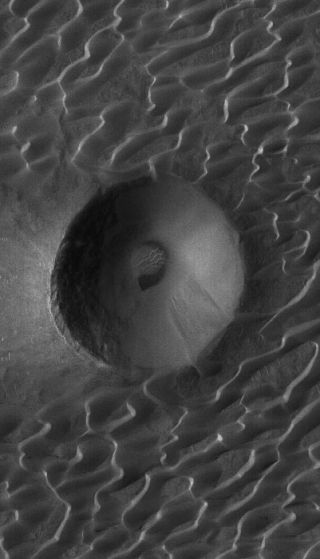 This Mars Global Surveyor image shows a martian crater that has been encroached by a field of dark, wind-blown sand dunes in the Syrtis Major volcanic region of the red planet. The sand dunes of Mars are in no rush to move acrossthe red planet?s surface, new research shows. It can take up to 1,000 years for dunes to movejust a few meters on Mars, largely due to the planet?s apparent lack of movingsurface water, weak winds and thin atmosphere, said the study?s author Eric Parteli. ?Mars dunes move much slower than Earth?sdunes,? said Parteli, a researcher at the University if Stuttgart in Germany, in an e-mail interview. Parteli and colleague Hans Hermann, of Brazil's Federal University of Ceará, used computer simulations to reproduce actual Martian dunes observed by the Mars Orbiter Camera aboard NASA's Mars Global Surveyor spacecraft. The images were taken before MarsGlobal Surveyor went silent last year, ending its 10-year studyof the red planet?s surface. The scientists found that a small Martian sanddune about 3-feet (1-meter) tall would need wind speeds 75 mph (120 kph) tomove appreciably. Since such winds are extremely rare on the redplanet, occurring just a few times each decade, the dunes of Mars are confined totheir glacial pace, the researchers said. The research is detailed in therecent edition of the journal Physical Review E.
The limiting factor, Parteli said, is theMartian atmosphere. On Earth, sand dunes are shaped by water andwind. But extensive scans of Mars by NASA'sSpirit and Opportunity rovers and orbiting spacecraft have yet to findliquid water on the red planet's surface. Dunes on Mars can reachheights of 20 feet (6 meters) and come in shapes ranging from crescents tostars, though similar sand dune formations are seen on Earth. The difference, Partelisaid, is that Mars tends to span more crescent-shaped (barchan) and transversedunes, while the long, sinewy linear dunes are more common on Earth. And while Martian winds can kick up sky-blottingdust storms like those that plagued the Spirit and Opportunity rovers thissummer, the atmosphere of Mars is 100 times less dense than that of Earth. Theresult, researchers said, are weaker winds that only rarely reach strengthscapable of moving Martian dunes. ?If sand-moving winds on Mars occurred asfrequently as they occur on Earth, Mars dunes would move 10 times faster thanEarth?s dunes,? Parteli told SPACE.com. According to the simulations, winds strongenough to create bimodal dunes - sand structures shaped by winds blowing inperpendicular directions - could take about 50,000 years to complete theirwork. "Of course, there are many winds on Marswhich change direction in a scale of hours," Parteli said. "Butthey're just not strong enough to move sand."